BaroqueAgain1 wrote: He didn't run like a short horse, he didn't run at all. And that's the thing that worries me...even a 80-90% Arrogate should have done better in the San Diego. He just didn't run. If the problem isn't fitness or sudden loss of the ability to run fast (which his recent work indicates he still has), then what if the problem is between his ears? That's my worry as well, especially given how he did seem to respond to Smith before throwing up his head midway into the turn. I do sort of wonder if Baffert had some nagging concern before the San Diego, just based on his demeanor before and after. One 4f work doesn't seem like it would be enough to elicit this response unless he felt the horse was doing better in other capacities as well. Or maybe I'm just looking into it too much... I do know that he's never been a unanimously great work horse and reviews were pretty mixed before the San Diego, his last work mostly excepted, so fingers crossed he looks better than ever leading up to the Pacific Classic. BaroqueAgain1 wrote: what if the problem is between his ears? It's my theory he saw it was a grade 2 and he couldn't be bothered. Is Arro working again on Tuesday? Was he not acting like his old self previously? Yeah...I thought the opinions about his works before the San Diego were pretty positive. Just because he's working with no issues doesn't mean he'll show the same form in the afternoon. If Baffert's hair weren't already white, I suspect he would be getting there with wondering what is going to happen with Arro in his next race. Some people felt that his works were not quite as impressive leading up to the San Diego ( having to be urged more, etc). Maybe that's part of the reason why he's the #1 dirt trainer in America!? 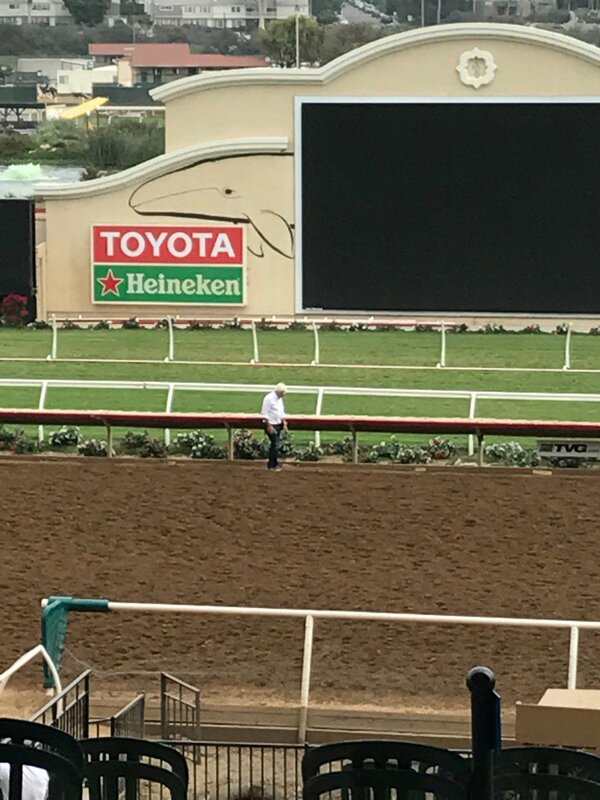 Have there been any complaints...or even quiet mutterings...about the Del Mar track being hard on horses? Jeff Mullins shipped his million-dollar maiden winner, Tatters To Riches, to San Luis Rey Downs training center for a half-mile workout, instead of working him over the surfside oval. BaroqueAgain1 wrote: Have there been any complaints...or even quiet mutterings...about the Del Mar track being hard on horses? The goal was to replicate the SantaAnita surface and it's not that, but injuries/fatalities are not a result, it's just different, deeper etc. and we still have horsesforcourses venue where the turf meets the surf. Opening workout of 25 and change is a bit concerning again. Doesn't want to show any early speed. Arrogate will rebound and win the Pacific Classic. Reassure his fans that he is back. Then I plan to bet on Accelerate to beat him in the BC Classic at 5-1 or higher. The way Arrogate has declined since the Travers, he should be around 110-113 BSF which is beatable. He will still be named Horse of the Year for making $13M off two races. I'm still an Arrogate fan and huge Baffert fan. But Accelerate is like Blame to me if Arrogate is like Zenyatta on the decline in 2010. Accelerate might not want 10F but he loves the track more than Arrogate. Victor Espinoza to end the Baffert BCC run and avenge him for Chrome's two defeats from Arrogate by beating him twice with Accelerate and a horse going to finish ahead of him thrice. Arrogate will likely win the PC at 3/5. Perhaps track record time. Perhaps a solid 115 BSF. The reassurance race to overbet him again the race after. But by BCC, he could be a bad play like his SD. Arrogate has declined at 4 like Easy Goer, Sunday Silence, and Rachel Alexandra all did. A flash in a plan great-lite like Ghostzapper but a quicker ascent and descent in form. Get him at 5-1 on BCC day while Arrogate becomes odds-on again and East Coast money going to Gun Runner. Watch Accelerate lose the PC to help his odds go up. Runs a modest 2nd and then avenges Arrogate in November. Gun Runner might soften him up but I still like Victor to wire the field. Mike vs Victor BC Round 2. Don't sleep on Stellar Wind either against Songbird. We all saw how Beholder lost to her twice and she seems to love running in Del Mar. Payback time for the newly elected HoFer with a horse on the upswing over a horse's form which returned back to Earth. Arrogate might no longer reach Pegasus-level anymore. I think there was a previous discussion about Peter Miller's dismay after the Sorrento S. when his undefeated two year old filly, Surrender Now, ran poorly and was eased. I'm not a huge Peter Miller fan, but others have said similar things. Now it turns out she was injured. Surrender Now, who won the Landaluce Stakes at Santa Anita in July but was last in the Grade 2 Sorrento Stakes on Aug. 5, has been sidelined with a fractured tibia, trainer Peter Miller said on Wednesday afternoon. Miller said it was unclear how long Surrender Now woule be sidelined. Surrender Now has won 2 of 3 starts and earned $92,745. She beat maidens in her debut by two lengths at Santa Anita on June 9 and won the Landaluce Stakes by eight lengths. In the Sorrento Stakes, Surrender Now set the pace but faded in the stretch and was eased by jockey Flavien Prat. I know that very firm, fast tracks can cause injuries due to concussion through the horse's skeletal system, but don't deep, tiring surfaces bring a different set of challenges? Maybe by putting more strain on the muscles and tendons as the horse tries to accelerate against the drag of a deep surface? IIRC, there were trainers who disliked synthetic surfaces for that very reason. While the fatal breakdown rate decreased, they pointed out that there were more soft tissue injuries, some of which could sideline a horse for lengthy periods. BaroqueAgain1 wrote: I know that very firm, fast tracks can cause injuries due to concussion through the horse's skeletal system, but don't deep, tiring surfaces bring a different set of challenges? Maybe by putting more strain on the muscles and tendons as the horse tries to accelerate against the drag of a deep surface? Absolutely. Deep surfaces are known to cause more tendon and muscular injuries than firm/shallow surfaces. Some synthetic tracks have this effect as well. Kind of unrelated, but when I worked at Woodbine, I remember asking some trainers their opinion on the change to Polytrack from dirt and they said that the deep/cushion surface of Polytrack doesn't give/move out of the way/breakdown when a horse's hoof pivots on it, causing more tendon injuries than had occurred on dirt. I don't recall him running so high headed before (down backstretch), and coming around the turn he dives to the rail before switching leads not so fluidly. I wonder a little how many paper clips are being used to hold him together (?). Once he switches to the right lead, he seems OK, and when he switches back in the gallop out he looks a lot better. I suppose the race may be telling. I didn't like his action when he came down the stretch in this work after switching leads. He didn't look comfortable to me (not saying he has a physical problem, he didn't run like he was hurting, but he also didn't run really fluid, seemed a bit choppy to me). Then again maybe he always looks like that, I didn't pay much attention to his previous works to be honest. Not over analyzing because he lost last time out, he just threw in a clunker on that day. I know what he is capable of, if he is at 100%.